Contemporary and Emergent Theories of Agrammatism provides an in-depth review of the previous five decades of research on agrammatism focusing specifically on work which has been informed by linguistic theory. The final chapters reflect the recent turning point in the conceptualization of the underlying causes of the impairments agrammatic individuals present with. The book includes chapters on * impairments to grammatical morphemes * the tree pruning and trace deletion hypotheses * verb deficits in sentences, and as single words * generalized minimality * adaptation theory and slow syntax * the involvement of discourse To facilitate student reading the writing is clear and accessible, and the book includes a glossary of unfamiliar terms. 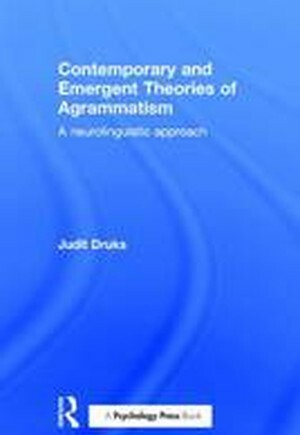 Contemporary and Emergent Theories of Agrammatism will be of great interest to advanced students and researchers in areas such as psychology of language, linguistics, neurolinguistics, aphasiology and speech and language therapy.